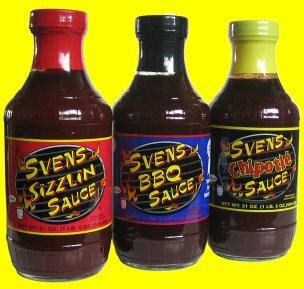 We’re glad you found us here at SvensBBQ.com! We’ve been making thick, rich barbeque sauce in the Midwest since 1995. We offer a tastefully sweet BBQ sauce, made from select ingredients, along with a touch of Scandinavian Minnesota pride, to satisfy any barbeque enthusiast. We have BBQ Sauce by the bottle or the case (12/21 oz bottles). We also have it by the gallon (172 oz or 10 lbs) for restaurant or catering use. All of our BBQ sauces are Gluten Free. We will have an online shop soon, until then. Please feel free to call or email us with questions, comments, suggestions, and orders. YA OK, HERE’S DA FUNDS. THANKS FOR SAVING US FROM HAVING TO CONSORT WITH SOME OTHER INFERIOR, LAME, TASTELESS STINKY, NO FLAVORED, FAKE INGREDIENT, SECOND HAND KETCHUP DAZZLED, PIG PUKE MEAT COVERING SLOP THAT SOME BIG CITY KITCHEN GURU STUMBLED UPON WHILE DRUNK.